At the time of major white penetration of the Great Basin and the Snake River areas in the 1840s, there were seven distinct Shoshoni groups. The Eastern Shoshoni, numbering about 2,000 under their famous Chief Washakie, occupied the region from the Wind River Mountains to Fort Bridger and astride the Oregon Trail. Their descendants today live on the Wind River Reservation. Two other divisions having similar cultures were the Goshute Shoshoni and the Western Shoshoni. The former, about 900 in number, lived in the valleys and mountains west and southwest of Great Salt Lake, with the remnants of their bands located in and around the small settlement of Ibapah, Utah, today. A much more numerous people, perhaps 8,000 strong, the Western Shoshoni occupied what is today northern and western Nevada. There were as many as eleven major bands distributed from the present Utah-Nevada border to Winnemucca on the west. Their descendants today live on the Duck Valley Reservation or scattered around the towns of northern Nevada from Wells to Winnemucca. 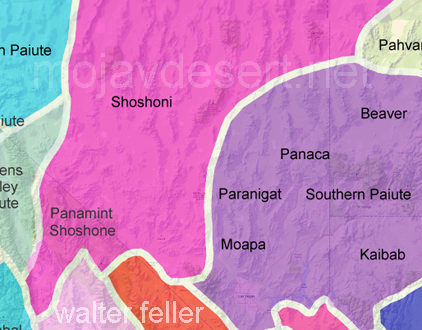 The four remaining groups of Shoshoni are usually listed under the general name of the "Northern Shoshoni." One of these groups, the Fort Hall Shoshoni of about 1,000 people, lived together with a band of about 800 Northern Paiute known in history as the Bannock at the confluence of the Portneuf and Snake rivers. A second division, the Lemhi, numbering some 1,800 people, ranged from the Beaverhead country in southwestern Montana westward to the Salmon River area, which was their main homeland. In western Idaho, along the Boise and Bruneau rivers, a third section of about 600 Shoshoni followed a life centered around salmon as their basic food. Finally, the fourth and final division of 1,500 people, the Northwestern Shoshoni, resided in the valleys of northern Utah--especially Weber Valley and Cache Valley--and along the eastern and northern shores of Great Salt Lake. There were three major bands of Northwestern Shoshoni at the time the first Mormon pioneers began settling northern Utah. Chief Little Soldier headed the misnamed "Weber Ute" group of about 400, who occupied Weber Valley down to its entry into the Great Salt Lake. Chief Pocatello commanded a similar number of Shoshoni, who ranged from Grouse Creek in northwestern Utah eastward along the northern shore of Great Salt Lake to the Bear River. The third division of about 450 people, under Chief Bear Hunter, resided in Cache Valley and along the lower reaches of the Bear River. Bear Hunter was regarded as the principal leader of the Northwestern Shoshoni, being designated by Mormon settlers as the war chief who held equal status with Washakie when the Eastern and Northwestern groups met in their annual get-together each summer in Round Valley, just north of Bear Lake. By the 1840s, the Northwestern Shoshoni had adopted most of the Plains Culture, using the horse for mobility and the hunting of game. Chief Pocatello especially led his band on numerous hunts for buffalo in the Wyoming area. Pocatello also gained notoriety as a reckless and fearless marauder along the Oregon and California trails. The Wasatch Mountains provided small game for the Northwestern bands, but of even greater importance were the grass seeds and plant roots which grew in abundance in the valleys and along the hillsides of northern Utah before the cattle and sheep of the white man denuded these rich areas and left many of the Shoshoni tribes in a starving condition and to suffer under the ignominy of being called "Digger Indians." Before white penetration, the Great Basin and Snake River Shoshoni had been among the most ecologically efficient and well-adapted Indians of the American West. The tragic transformation for the Northwestern Shoshoni to a life of privation and want came with the occupation by Mormon farmers of their traditional homeland. The white pioneers slowly moved northward along the eastern shores of Great Salt Lake until by 1862 they had taken over Cache Valley, home of Bear Hunter's band. In addition, California-bound emigrants had wasted Indian food supplies as the travelers followed the Salt Lake Road around the lake and across the salt desert to Pilot Peak. The discovery of gold in Montana in 1862 further added to the traffic along the route. The young men of Bear Hunter's tribe began to strike back in late 1862, raiding Mormon cattle herds and attacking mining parties traveling to and from Montana. The Indian aggression came to an end on 29 January 1863. On the morning of that day, Colonel Patrick Edward Connor and about 200 California Volunteers from Camp Douglas in Salt Lake City assaulted the winter camp of Bear Hunter's Northwestern group of 450 men, women, and children on Beaver Creek at its confluence with the Bear River, some twelve miles west of the Mormon village of Franklin in Cache Valley. As a result of the four-hour carnage that ensued, twenty-three soldiers lost their lives and at least 250 Shoshoni were slaughtered by the troops, including ninety women and children in what is now called the Bear River Massacre. Bear Hunter was killed, and the remnants of his tribe under Sagwitch and the chiefs of nine other Northwestern bands signed the Treaty of Box Elder at Brigham City, Utah, on 30 July 1863, bringing peace to this Shoshoni region. After the signing of the Box Elder agreement, government officials attempted to get all of the Northwestern Shoshoni to move to the newly founded Fort Hall Indian Reservation in Idaho. After several years of receiving their government annuities at Corinne, Utah, near the mouth of the Bear River, the Indians bands finally gave up their homelands in Utah and settled at Fort Hall, where their descendants live today. As a result of their move to Idaho, the Northwestern Shoshoni have been lost to Utah history although for centuries they had lived in northern Utah. It is time for Utah historians to make the Shoshoni a prominent part of the state's history along with the Navajo, Paiute, and Ute tribes.